I came across this title in the course of researching on the subject of introversion among Christian pastoral leaders. 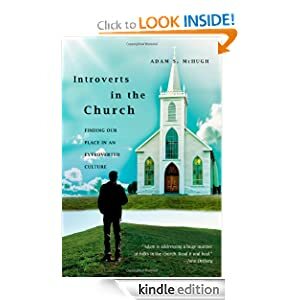 The author, Adam McHugh, has written a lucid and thorough, though very readable, theological reflection on the subject of being an introvert (in the Jungian / Myers-Briggs sense) in the context of the evangelical church community, whether as a minister / leader or as a general church member. The reader who values clear, thoughtful exposition of the Bible will be very pleased by the way McHugh has blended personal experience, contemporary cultural awareness, psychological insights and biblical truth. He encourages introverts to takes their place in all parts of the church, as the people they are. Alongside that he likewise makes a compelling case for the evangelical church to value the strengths introverts can bring to pastoral ministry, and to positively embrace them as members of leadership teams, for the good health of the whole church. This book is timely in a church culture which, in my view, has drifted into a socially imbalanced and biblically deficient obsession with leadership models which are heavily skewed in favour of extroverted personalities. The cultural context McHugh writes from and to is that of the US, where extroversion predominates in church and ministry life to a degree significantly greater than is the case here in Australia, where I am. In that sense some sentiments in the book related to the deep personal struggles of introverts in the church environment, are less applicable here. However the difference is at most slight for this of us in leadership in Australian churches, since US models predominate here also. If God had meant some people to wear clerical collars he’d have created us with a docking station either side of the Adam’s apple.